David Sheff (Steve Carell) is a freelance writer, whose son, Nic (Timothee Chalamet) has a serious drug addiction to Crystal Meth. We are taken back in time to a day 1 year before.. Nic is 18 years old now and has gone missing. His dad is frantic with worry and searches everywhere he can think of for his boy… Nic turns up but will not tell David where he’s been or who he’s been with. David desperately wants Nic to go into a drug rehab programme but then he goes awol again. When he reappears, Nic is in a really bad way. He wants to get clean but the pull of the drugs keeps dragging him back under. David is physically doing everything he can to get Nic off and away from the Crystal Meth that he is now injecting into his body. Can Nic ever get clean and be totally off the drugs? 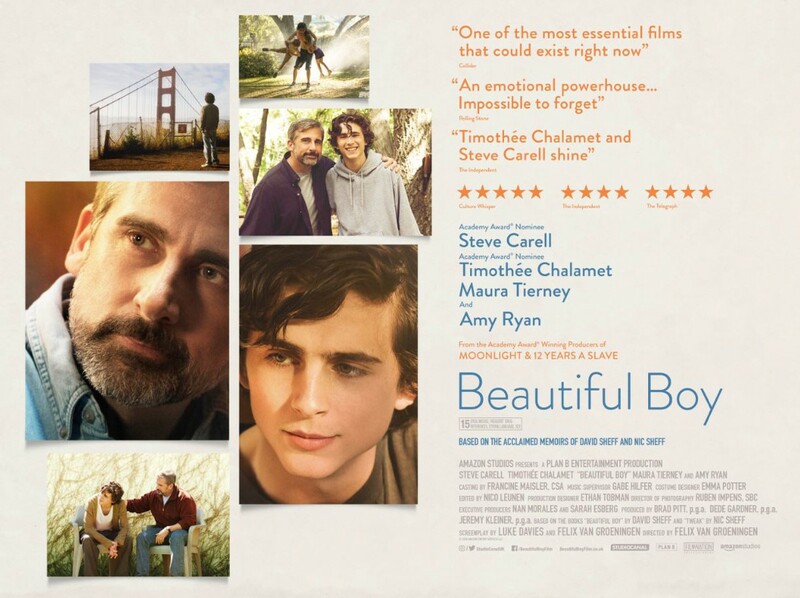 Based on the bestselling memoirs of David and Nic Sheff, ‘Beautiful Boy’ is a story of family, the bond between a father and a son, battles with addiction and hopelessness. Steve Carell just seems to be going from strength to strength with his serious acting roles of late. He’s absolutely caning it. Every time I see him in a movie now, he just seems to be getting better and better. In one piece though, where he is standing outside and shouting at Nic, Brick from Anchorman came into my mind. A really fantastic portrayal of a family’s struggle with long term drug addiction and recovery, ‘Beautiful Boy’ is definitely one to watch.